How Easy Is It To Automate a WordPress Site? BlogBlog » How Easy Is It To Automate a WordPress Site? The answer is that it’s very, very easy to automate your WordPress site with Uncanny Automator. It takes under 5 minutes to set up each recipe, and that’s not just for experienced users. 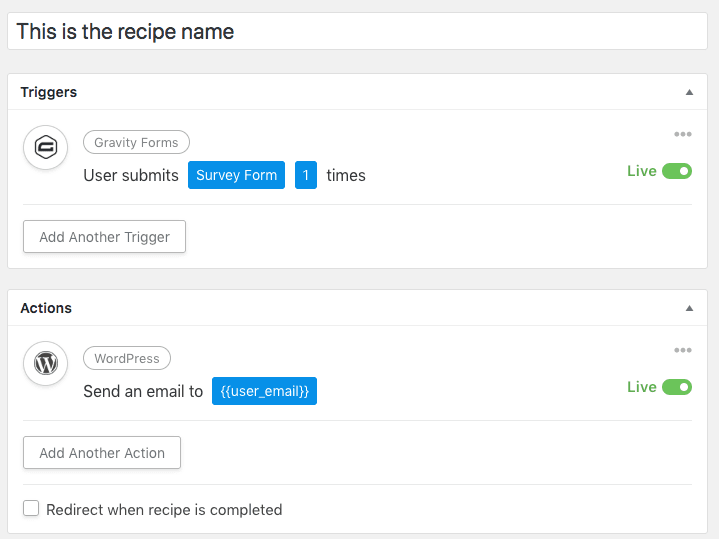 If you’ve installed and configured a WordPress plugin, you can easily create recipes that save admin time and deliver a better user experience. In this blog post, we’re going to walk through the process of setting up your very first recipe. And just to prove that you can do it in under 5 minutes, here’s a video that explains everything, with lots of detail and step-by-step instructions. And it’s under 4 minutes long. How easy was that? Without Uncanny Automator, there’s no other way (outside of custom development) to even make that specific workflow happen. So that recipe, set up in 4 minutes, might have just saved a site owner a week of development time and $1,000 in development costs. Let’s take a look at how to build some recipes that will save you time and money. An Uncanny Automator “recipe” tells your site that when this happens, do that. Every recipe has 3 things: a name, triggers, and actions. The name is what helps you to remember what every recipe does. Triggers are what the recipe watches for to start running the recipe and doing things. Let’s take a simple example. When a user buys a product, send them an email. Buying a product is the trigger. And sending the email is the action. Before we start looking at the specific steps to build a recipe, let’s take a look at a screenshot to review what goes into a recipe. Of course, that recipe is really simple. And Gravity Forms already does notification emails! But this is a good example to show how easy it is to set recipes up and understand what they do, and your own recipes can be as simple or as complex as you want (add several triggers and actions to a single recipe if you want to!). For our actual example in WordPress, let’s try a recipe that’s still simple but a bit more useful. In other words, we don’t know any other way to do this without custom development. Here’s what we’ll use: When a user buys a specific WooCommerce product, we’ll add the user to a BuddyPress group. That’s kind of interesting and might be quite valuable on social sites using BuddyPress. The first step is simple and is really the same as creating any other WordPress post. Navigate to Uncanny Automator > New Recipe as an administrator. Now you’re on the recipe creation page! Choose a name for your recipe next. You’ll want to be specific here, because you may want to create lot of recipes. As an example, if you have 10 products you sell and have different sales recipes for each, that’s 10 recipes just for your product sales. For our example, of course, the trigger will be a user buying a specific product in WooCommerce. That means, the integration we select in the Triggers section is WooCommerce. Then we’ll choose “User purchases” a product, we’ll choose the product, and save the trigger. And that’s it, the trigger part of the recipe is ready to go. Adding a new action is just as easy as adding a trigger. Click Add Action to see a list of available integrations for actions. The list you see will depend on the plugins installed on your site. For our example, we’ll choose BuddyPress. We want to “Add user to a group”, and then we need to choose the group. After the group selection, save the action. Now the action part of this recipe is done. The recipe has now been created but it’s not yet running on the site. What’s it missing? You may have noticed in the images that there were “Draft” switches. Those need to be made “Live”. Switching the trigger to Live, then the Action, and finally the recipe itself over on the right side of the page takes the recipe live. And after that final step, any user on the site that now buys the Intro to Marketing product will be added to the associated BuddyPress group. Automatically. And to make sure everything happened properly, there are reports for everything. Want to see more examples of how easy it is? Check out our Knowledge Base article to Create a Recipe, and as you start tackling more advanced recipes our Managing Triggers and Managing Actions articles will be invaluable. If you’re not yet an Uncanny Automator user, reading this article is no substitute for trying it out on your site. And since we offer a 30-day money-back guarantee, you have nothing to lose by trying Automator for yourself! Use integration plugins on your WordPress site? We have a better way, guaranteed. Put your site on autopilot with a simple automation tool that connects over a dozen plugins seamlessly. GamiPress, MemberPress, Popup Maker and More! GamiPress, MemberPress and Popup Maker join the Uncanny Automator family in the 1.2 release. With 12 new triggers and actions, the 1.2 update is a must-have for Uncanny Automator users. Uncanny Automator 1.4 is now available! Uncanny Automator 1.3 is now available! previous post: What’s New in Uncanny Automator 1.1?